In every place I've ever lived, I've always found the bathroom to be the hardest place to decorate. Having to work with the layout and space that's already there can be a tricky one, especially when you know you have quite a lot of stuff to fit into small room (I know I'm not the only one with hoardes of hair stuff, shower gel and other bath goodies that will probably take me a year to get through!) It might seem as though there's not much more you can do than give it a good clean and hope for the best, but there are definitely a few things you can do to maximise the space. 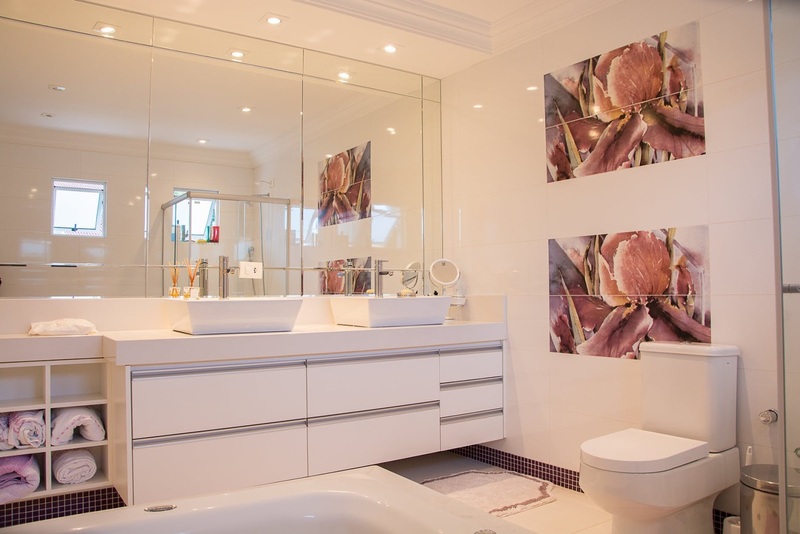 Here are five tips for making your bathroom look bigger! This is a foolproof way to make any room look bigger, but when most bathrooms are so tiny a dark wall colour will make them look even more closed in. Plain white and light neutrals are always a good idea, and will match whatever colour tiles you already have up (luckily mine are plain white, although I know not all renters are so fortunate and it might be a case of working with what you have!) If you're not much of a DIY-er, consider getting professional painters and decorators in to get the best finish possible. In a small room you're going to want to make the most of whatever light comes in, heavy window coverings which block out too much light will leave the room looking dark and dingy. Slatted venetian or vertical blinds are good choice, not only do they let in plenty of light but can easily be adjusted and closed to give you privacy. Places like Homebase do these quite cheaply, or you could get one professionally fitted if your window is a funny size. A light coloured roller blind would work too, although I don't think they're quite as nice. This is another classic trick to make a room look bigger and maximise light, but one you can definitely take advantage of in the bathroom seeing as you're going to need a mirror in there anyway. If you're peering into a tiny mirror when you brush your teeth, consider replacing it with a bigger size and making it a statement piece. The best place to hang it is opposite the window where it will reflect the most light back into the room. Huge sets of drawers might hold a lot of products (and feel like your best bet especially when you have a lot of stuff!) but in a small bathroom it might easily dominate the space and leave it feeling small and crowded. I saw some great bathroom furniture at My Bathrooms recently, which were tall and slim pieces which don't take up much floor space. Take advantage of any inbuilt nooks that could fit a piece of furniture and utilise wall space; installing a medicine style cabinet or a towel rail on the walls again means you're adding storage without crowding the floor. A good way to make the space you have look bigger and more open is to switch up your shower curtain to something white or clear- or even better fit a glass screen instead. While a shower curtain is an important part of any bathroom, patterns or dark colours can look busy and distracting. Personally I'd say that the shower curtain should be as inconspicuous as possible rather than being a statement piece in the room. It goes without saying that a clean and tidy room will look bigger and more spacious than one that's full to the brim with clutter. Remove any bottles and products from around the bath and organise them into suitable storage containers (I love the look of apothecary jars) and fold towels or hang them on hooks on the back of the door. Choosing the right accessories will help too, rather than lots of smaller bits and pieces you could go for one or two select items that add some colour and interest without taking up a lot of space. Do you have any tips for making a small bathroom look bigger?